This wooden award measures 12x20” and depicts a baseball player holding a bat with four eagles surrounding him beneath. 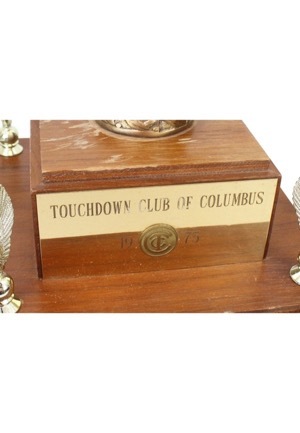 Engraved on the top plate reads “TOUCHDOWN CLUB OF COLUMBUS 1975” and the bottom plate reads “JOHN. 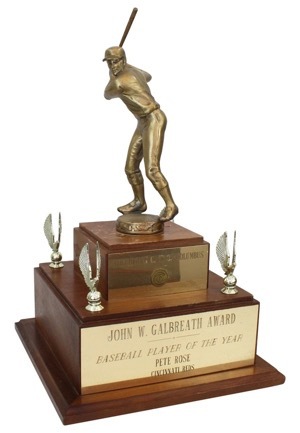 W. GALBREATH AWARD BASEBALL PLAYER OF THE YEAR PETE ROSE CINCINNATI REDS”. 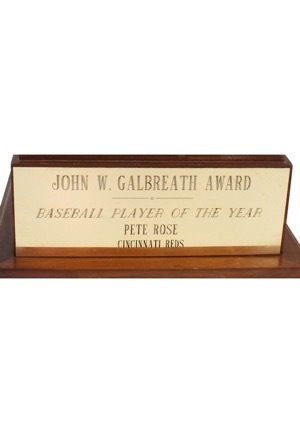 Age appropriate fading and some scratching to the wood is present.